BetOnline Casino Review - Is BetOnline Legal For USA Players? BetOnline excels in several facets of online gambling, but perhaps most notably is the online casino found on their site. BetOnline offers players a full casino complete with hundreds of games available for real-money gambling. Players with accounts at BetOnline enjoy a fresh, new perspective for sleek online casinos. The casino at BetOnline mixes classical favorites with new games, cash bonus options and great customer support. Readers will find that BetOnline rates high across many of the important categories that make legal online casinos successful. This full review of the BetOnline casino has great information which can be applied to all aspects of the website. Players wanting to play for free or for cash in hand will need to create an account. This process only entails a couple of steps. During the signup, very basic personal information will be asked, most importantly, age verification and state of residence. BetOnline accepts players in the U.S. from all 50 states. BetOnline places importance on the security of users, so to get in and out of the BetOnline casino, users will have a login. This is first verified through an initial email following the creation of the account, and players must create a password to use with their account to log in. To play for money, users will need to fund their account via a deposit. Of all the online casinos reviewed on this website, BetOnline might have the best selection of methods to fund. BetOnline accepts all major credit card brands for USA players in Visa, Mastercard, Discover, or American Express. Outside of the credit card options, BetOnline has several more. A rapid transfer through a third party service like Western Union or MoneyGram may also be used to if a player would prefer to use cash. Users may also send in a money order through the mail which will be deposited as soon as BetOnline receives it. BetOnline can also set up a wire directly into your bank account. This method can take some complicated steps to set up, but once it works, you will be able to move money around in your account with ease. BetOnline offers several casino-specific cash rewards. Players can receive a 100% match bonus on slots on all deposits over $100. This can be achieved through the bonus code SLOTS100. In addition to this, a 25% reload bonus can be had on deposits of $25 or more using the bonus code CASINO25. This great bonus is available anytime a player reloads on their account. 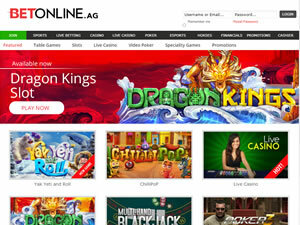 One of the aspects of the website that BetOnline pushes is the live casino dealer. As such, players will get a free $25 no-risk wager on their first live dealer bet. The wager comes from the user's account, but will be refunded if it does not hit. There is no code needed here. The bulk of attention at any online casino is the games, and BetOnline has plenty of them. The full casino will give all types of players something do. On the home screen of the casino, players will find a list of user-favorites. These often cover several different game types. BetOnline has four categories of games. They are table games, slots, 3D slots, and video poker. Clicking into each tab will give users the complete set of games available with a given category. In total, there are more than 100 games that BetOnline account holders can wager for real money. While slots and table games are the most-played on site, classic table games such as blackjack and roulette can also be found. If slots are your game, there are a half-dozen types of slots available. This includes options where the jackpots can be huge! BetOnline Casino Software - What's Under The Hood? BetOnline uses Real Time Gaming software which is found in just about every Internet casino today. The reason for this is simple: it's the best. From game-operation, to banking and security, RTG casinos are a step above the rest. Players should feel very confident that BetOnline uses the best casino software for their users. For players looking to withdraw from BetOnline, several options exist. The fastest way for users to receive a payout is through a third party rapid transfer like Western Union or Moneygram. BetOnline states that wire transfers can take between 12-36 hours, so same day payouts can take place if the request is made early enough. A wire transfer will usually have fees attached, based on how much is being withdrawn. There are three check options that can be chosen, and the variable is the delivery method. A check through the mail, courier, and an ExpressCheck (which is a service that can send your check overnight) can be sent. There are different fees and wait times associated with each delivery method, with a larger fee usually being attached to the quickest method. Another option to consider is a bank wire. This takes 7-10 days to be received. The limit of $15,000 is the highest on site though. For players withdrawing large sums, this is usually your best option, even if setting up the bank wire initially can be a lot of work. BetOnline customer help can be reached several ways. General email inquiries can be answered as cs@BetOnline.com. A phone number at 1-888-426-3661 can also be used. The specific casino email is casino@BetOnline.com. Customer support at BetOnline never sleeps, so feel free to contact them 24/7.